The maximum capacity for interconnection with the grid at a specific voltage level shall be as specified in the Distribution Code/Supply Code of the State and amended from time to time. Following criteria have been suggested for selection of voltage level in the distribution system. Identification of buildings/leasing rooftop of buildings for 25 years. Obtaining an NOC (No Objection Certificate) from the DISCOM (Distribution Company) for grid connectivity. 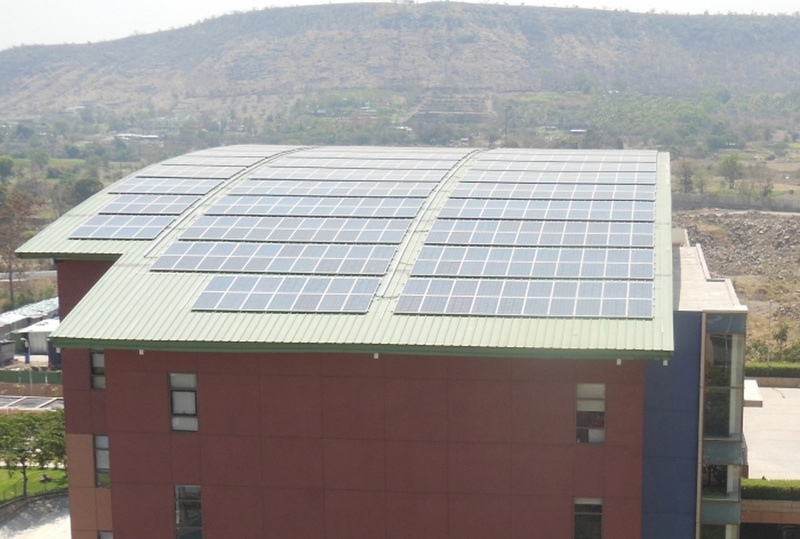 Complete design, engineering, manufacture, supply, storage, civil work, erection, testing and commissioning of the grid connected rooftop solar PV project. O&M (Operations and Maintenance) of the project for a period of 5 years for PART-A & Part C and O&M of the project for a period of 25 years for PART B after commissioning of the projects as per SECI’s acceptance. The goods supplied under this contract are new, unused, of the most recent or latest technology and incorporate all recent improvements in design and materials. Warranty covering the rectification of any and all defects in the design of equipment, materials and workmanship including spare parts for a period of 5 years from the date of commissioning for PART-A/PART-C projects and for 25 years for PART-B projects. The solar company shall transfer all the Guarantees/ Warranties of the different components to the Owner of the project. The responsibility of operation of Warrantee and Guarantee clauses and Claims/ Settlement of issues arising out of said clauses shall be joint responsibility of the solar installer/ developer and the owner of the project. The solar company shall be required to meet minimum guaranteed generation with Performance Ratio (PR) at the time of commissioning and related Capacity Utilization Factor (CUF) as per the GHI levels of the location during the O&M period. PR should be shown minimum of 75% at the time of inspection for initial commissioning acceptance to qualify for release of 30% subsidy. Minimum CUF of 15% to be maintained for a period of 5 years is one of the conditions for release of PBG. The solar company should send the periodic plant output details to SECI for ensuring the CUF. The PR will be measured at Inverter output level during peak radiation conditions. For General category states, the 20% subsidy shall be disbursed after successful Commissioning and acceptance of project and balance 10% subsidy after completion of first year of successful O&M. SECI has also included definitions of certain terms. Aforementioned, wherever the following words are used, their definition is listed. RESCO model shall mean where the bidders/Developers intend to take a rooftop owned by some other entity on mutually agreed terms and conditions including lease agreement from the roof top owner(s) and enters into the PPA with rooftop owner / DISCOM / others for supply of Solar power for 25 years at a tariff as per SECI Tender Document from the date of Commissioning of project. Rooftop Solar PV under the SECI tender shall mean solar PV array/system installed on the flat /inclined roof of the building / elevated platform on metallic or concrete structure minimum 10 feet above ground level / Ground mounted system (in the places where sufficient shadow free rooftop area is not available.) In such instance up to 40% Solar PV array/system capacity can be accommodated on nearby unutilized land subject to the SECI’s approval. Very good initiative. Would like to Kw system in my home. Hi Ajeet, thank you for your interest. You may run our solar calculator to know the system size most relevent to your requirement. link: https://www.itsmysun.com/solar-calculator/. 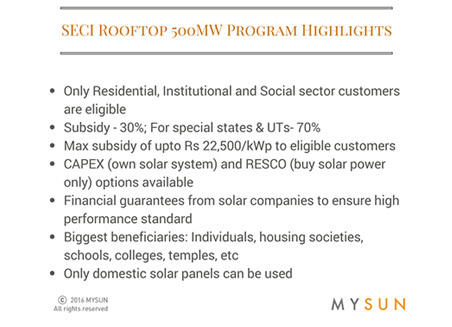 You may also register your rooftop with MYSUN at https://www.itsmysun.com/register-your-rooftop-for-solar/ .Post regsiteration, our solar advisors will be in touch with you to explain the steps further. Hi Daljeet, Thank you for your interest in working with us.Please share your contact details or reach out to us at 0120-4753500. Hello Sir, thank you for your acknowledgement. MNRE subsidy is being disbursed through multiple agencies, SECI being one of them and the other being the respective state nodal agencies. You can claim subsidy only through one channel either through SECI or through the concerned state nodal agency & MNRE. If claimed through SECI user gets subsidy of 30% of the lowest bid in that particular state and is available only for a limited period. This can only be claimed if the user works with an installer who has been allocated subsidy under the SECI scheme. The SECI subsidy provided to customer will be claimed by the developer who has won an allocation under SECI scheme, customer has to pay subsidised amount, subsidy portion of project cost will be claimed by developer directly from SECI. This a limited time and limited capacity scheme and will become unavailable once the allocations are exhausted. On the other hand if user claims subsidy through MNRE and state nodal agency, user gets subsidy of 30% of the total project cost, cost of project is capped at Rs 75/ Wp. The MNRE subsidy provided, has to be claimed directly from MNRE through developer who are empanelled by MNRE as channel partner. To claim subsidy project has to be first approved by state nodal agency and then forwarded to MNRE. The reimbursement of subsidy takes considerable time (around 6 months) and also depends on the availability of budget. If you claim SECI subsidy, subsidy you will get is 30% of lowest bid for your state. For Delhi, the SECI subsidy is Rs.17,100 per kWp. So the final amount you have pay at the time of installation will be Rs.52,900 per kWp. This is much easier to avail since there is a scheme open at present and the allocations have not yet been exhausted. If you go for the MNRE subsidy, the subidy is 30% of the project cost, i.e. Rs 21,000 per kWp. So the final amount you have to pay at the time of installation will be Rs. 70,000 per kWp and then claim the subsidy of Rs 21,000 per kWp from MNRE. However, this will be subject to your project being approved and availability of the relevant budgets. We are a solar developer company based in Bangalore. Can we now apply to get SECI Subsidy budget? If yes, can you please detail out the procedure for the same? Is there a contact number/person with whom I can discuss about this? I have a Warehouse of about One lackh Squre Feet,at Nanjangud, Mysore. I wish to instal a grid connected roof top solar power plant, to sell generated power to discom on ppa model. My present connected capacity is 10KW and my power charges per month is about Rs6000. I want to go for a minimum of 500 KW capacity. Alternately : There are a many big large scale industries around my warehouse in the Industrial area, can I install a roof top and sell power to any one industry who wishes to buy power from me on a long term agreement. Please give me details about how to connect with this subsidy scheme as I am a system installer.